Landlord will perform the Tenant Improvements as described in the attached Exhibit C above. Subject to Landlord's obligation to complete the Tenant Improvements, Landlord shall have delivered possession of the Premises to Tenant on the Commencement Date, AS-IS in its present condition on the Commencement Date. Tenant acknowledges that neither Landlord nor its agents or employees have made any representations or warranties as to the suitability or fitness of the Premises for the conduct of Tenant's business or for any other purpose, nor has Landlord or its agents or employees agreed to undertake any alterations or construct any tenant improvements to the Premises except as expressly provided in this Lease. If for any reason, Landlord cannot deliver possession of the Premises to Tenant on the Commencement Date, (a) this Lease will not be void or voidable and Landlord will not be liable to Tenant for any resultant loss or damage, and (b) the Commencement Date and Expiration Date shall each be delayed by one day for each day of such delay; provided, however, if the Commencement Date is delayed by more than 90 days, Tenant, by written notice to Landlord prior to the Commencement Date, may terminate this Lease. Tenant will execute the Commencement Date Certificate attached to this Lease as Exhibit E within 15 days of Landlord's request. Throughout the Term of this Lease, Tenant will pay Monthly Rent to Landlord as rent for the Premises. Monthly Rent will be paid in advance on or before the first day of each calendar month of the Term. If the Term commences on a day other than the first day of a calendar month or ends on a day other than the last day of a calendar month, then Monthly Rent will be appropriately prorated by Landlord based on the actual number of calendar days in such month. If the Term commences on a day other than the first day of a calendar month, then the prorated Monthly Rent for such month will be paid on or before the first day of the Term. Monthly Rent will be paid to Landlord, without written notice or demand, and without deduction or offset, in lawful money of the United States of America at Landlord's Address, or to such other address as Landlord may from time to time designate in writing. 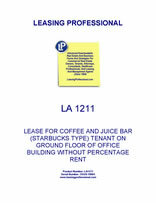 (a) In addition to Monthly Rent, beginning on January 1, 1998, Tenant will pay Tenant's Share of the amount by which the Operating Expenses paid, payable or incurred by Landlord in each calendar year or partial calendar year during the Term exceeds the product of (i) the Operating Expenses Base times (ii) the Rentable Area of the Building. If Operating Expenses are calculated for a partial calendar year, the Operating Expenses Base will be appropriately prorated. (2) The cost (amortized over such period as Landlord will reasonably determine) together with interest at the greater of (A) the Prime Rate prevailing plus 2% or (B) Landlord's borrowing rate for such capital improvements plus 2%, on the unamortized balance of any capital improvements (i) which are made to the Project by Landlord for the purpose of reducing Operating Expenses, or (ii) which are required under any governmental law or regulation that was not applicable to the Project at the time it was constructed and which are not a result of special requirements for any tenant's use of the Building (whether or not such law or regulation is applicable to the Building as a result of Landlord's or any tenant's status under such law or regulation, Landlord's or any tenant's use, occupancy, or alteration of any portion of the Building, or improvements made by or for any tenant in its premises). Notwithstanding the foregoing, the Building's Operating Expenses will not include the cost of capital improvements which are required to be made to any tenant's premises by such tenant pursuant to Section 8.1. (c) The Operating Expenses will not include: (1) depreciation on the Project (other than depreciation on personal property, equipment, window coverings on exterior windows provided by Landlord and carpeting in public corridors and common areas); (2) costs of alterations of space or other improvements made for tenants of the Project; (3) finders' fees and real estate brokers' commissions; (4) ground lease payments, mortgage principal or interest; (5) capital items other than those referred to in clause (b)(2) above; (6) costs of replacements to personal property and equipment for which depreciation costs are included as an Operating Expense; (7) costs of excess or additional services provided to any tenant in the Building which are directly billed to such tenants; (8) the cost of repairs due to casualty or condemnation which are reimbursed by third parties; (9) any cost due to Landlord's breach of this Lease; (10) any income, estate, inheritance, or other transfer tax and any excess profit, franchise, or similar taxes on Landlord's business; (11) all costs, including legal fees, relating to activities for the solicitation and execution of leases of space in the Building; and (12) any legal fees incurred by Landlord in enforcing its rights under other leases for premises in the Building. (d) The Operating Expenses which vary with occupancy and which are attributable to any part of the Term in which less than 95% of the Rentable Area of the Building is occupied by tenants, will be adjusted by Landlord to the amount which Landlord reasonably believes that they would have been if 95% of the Rentable Area of the Building had been so occupied. (e) Tenant acknowledges that Landlord has not made any representation or given Tenant any assurances that the Operating Expenses Base will equal or approximate the actual Operating Expenses per square foot of Rentable Area of the Premises for any calendar year during the Term. In no event shall Operating Expenses within the control of Landlord exceed 5% per year. 5.2 Estimated Payments. Commencing on January 1, 1998 and hereafter during each calendar year or partial calendar year in the Term, in addition to Monthly Rent, Tenant will pay to Landlord on the first day of each month an amount equal to 1/12 of the product of Tenant's Share multiplied by the "Estimated Operating Expenses" (defined below) for such calendar year. "Estimated Operating Expenses" for any calendar year shall mean Landlord's reasonable estimate of Operating Expenses for such calendar year less the product of the Operating Expenses Base multiplied by the Rentable Area of the Building and shall be subject to revision according to the further provisions of this Section 5.2 and Section 5.3. During any partial calendar year during the Term, Estimated Operating Expenses will be estimated on a full-year basis. During each December during the Term, or as soon after each December as practicable, Landlord will give Tenant written notice of Estimated Operating Expenses for the ensuing calendar year. On or before the first day of each month during the ensuing calendar year (or each month of the Term, if a partial calendar year), Tenant will pay to Landlord 1/12 of the product of Tenant's Share multiplied by the Estimated Operating Expenses for such calendar year; however, if such written notice is not given in December, Tenant will continue to make monthly payments on the basis of the prior year's Estimated Operating Expenses until the month after such written notice is given, at which time Tenant will commence making monthly payments based upon the revised Estimated Operating Expenses. In the month Tenant first makes a payment based upon the revised Estimated Operating Expenses, Tenant will pay to Landlord the difference between the amount payable based upon the revised Estimated Operating Expenses and the amount payable based upon the prior year's Estimated Operating Expenses, for each month which has elapsed since December. If at any time or times it reasonably appears to Landlord that the actual Operating Expenses for any calendar year will vary from the Estimated Operating Expenses for such calendar year, Landlord may, by written notice to Tenant, revise the Estimated Operating Expenses for such calendar year, and subsequent payments by Tenant in such calendar year will be based upon such revised Estimated Operating Expenses. 5.3 Annual Settlement. Within 120 days after the end of each calendar year or as soon after such 120-day period as practicable, Landlord will deliver to Tenant a statement of amounts payable under Section 5.1 for such calendar year prepared and certified by Landlord. Such certified statement will be final and binding upon Landlord and Tenant unless Tenant objects to it in writing to Landlord within 60 days after it is given to Tenant. If such statement shows an amount owing by Tenant that is less than the estimated payments previously made by Tenant for such calendar year, the excess will be held by Landlord and credited against the next payment of Rent; however, if the Term has ended and Tenant was not in default at its end, Landlord will refund the excess to Tenant. If such statement shows an amount owing by Tenant that is more than the estimated payments previously made by Tenant for such calendar year, Tenant will pay the deficiency to Landlord within 30 days after the delivery of such statement. Tenant may review Landlord's records of the Operating Expenses, at Tenant's sole cost and expense, at the place Landlord normally maintains such records during Landlord's normal business hours upon reasonable advance written notice. 5.4 Final Proration. If this Lease ends on a day other than the last day of a calendar year, the amount of increase (if any) in the Operating Expenses payable by Tenant applicable to the calendar year in which this Lease ends will be calculated on the basis of the number of days of the Term falling within such calendar year and Tenant's obligation to pay any increase or Landlord's obligation to refund any overage will survive the expiration or other termination of this Lease. If Tenant's audit reveals an overstatement of the total Operating Expense of more than 5%, then Landlord shall pay the cost of Tenant's audit. (2) Upon this transaction or any document to which Tenant is a party creating or transferring an interest or an estate in the Premises. (b) Tenant will not be obligated to pay any inheritance tax, gift tax, transfer tax, franchise tax, income tax (based on net income), profit tax, or capital levy imposed upon Landlord. (c) Tenant will pay promptly when due all personal property taxes on Tenant's personal property in the Premises and any other taxes payable by Tenant, the non-payment of which might give rise to a lien on the Premises or Tenant's interest in the Premises. 5.6 Additional Rent. Amounts payable by Tenant according to this Article 5 will be payable as Rent, without deduction or offset. If Tenant fails to pay any amounts due according to this Article 5, Landlord will have all the rights and remedies available to it on account of Tenant's failure to pay Rent. (c) Such other insurance as Landlord reasonably determines from time to time or required by any Superior Lien (as defined in Section 19.1). The insurance coverages and amounts in this Section 6.1 will be reasonably determined by Landlord, based on coverages carried by prudent owners of comparable buildings in the vicinity of the Project. (b) Insurance covering all of Tenant's furniture and fixtures, machinery, equipment, stock and any other personal property owned and used in Tenant's business and found in, on or about the Project. (d) If Tenant operates owned, hired or nonowned vehicles on the Project, comprehensive automobile liability will be carried at a limit of liability not less than $500,000 combined bodily injury and property damage. 6.3 Forms of the Policies. Certificates of insurance, together with copies of the endorsements when applicable naming Landlord and any others specified by Landlord as additional insureds, will be delivered to Landlord prior to Tenant's occupancy of the Premises and from time to time at least 10 days prior to the expiration of the term of each such policy. All Commercial General Liability or comparable policies maintained by Tenant will name Landlord and such other persons or firms having an interest in the Project (whether as owner or mortgagee) as Landlord specifies (in writing) from time to time as additional insureds entitling them to recover under such policies for any loss sustained by them, their agents and employees as a result of the negligent acts or omissions of Tenant. All such policies maintained by Tenant will provide that they may not be terminated nor may coverage be reduced except after 30 days' prior written notice to Landlord. All Commercial General Liability and property policies maintained by Tenant will be written as primary policies, not contributing with and not supplemental to the coverage that Landlord may carry. 6.4 Waiver of Subrogation. Landlord and Tenant each waive any and all rights to recover against the other or against any other tenant, occupant of the Project or Superior Lien holder, or against the officers, directors, shareholders, partners, joint venturers, employees, agents, customers, invitees or business visitors of such other party or of such other tenant or, occupant of the Project, or Superior Lien holder, for any loss or damage to such waiving party arising from any cause covered by any property insurance required to be carried by such party pursuant to this Article 6 or any other property insurance actually carried by such party to the extent of the recovery under such policy. Landlord and Tenant, from time to time, will cause their respective insurers to issue appropriate waiver of subrogation rights endorsements to all property insurance policies carried in connection with the Project or the Premises or the contents of the Project or the Premises. Tenant agrees to cause all other occupants of the Premises claiming by, under or through Tenant to execute and deliver to Landlord such a waiver of claims and to obtain such waiver of subrogation rights endorsements. 6.5 Adequacy of Coverage. Landlord, its agents and employees, make no representation that the limits of liability specified to be carried by Tenant pursuant to this Article 6 are adequate to protect Tenant. If Tenant believes that any of such insurance coverage is inadequate, Tenant will obtain such additional insurance coverage as Tenant deems adequate, at Tenant's sole expense. The Premises will be used only for a retail coffee and juice operation with related food service, and for ancillary office purposes. Tenant will not (a) do or permit to be done in or about the Premises, nor bring to, keep, or permit to be brought or kept in the Premises, anything which is prohibited by or will in any way conflict with any law, statute, ordinance, or governmental rule or regulation which is now in force or which may be enacted or promulgated after the Date; (b) do or permit anything to be done in or about the Premises which will in any way obstruct or interfere with the rights of other tenants of the Building or Project or injure or annoy them; (c) use or allow the Premises to be used for any immoral or unlawful, purpose; (d) cause, maintain, or permit any nuisance in, on, or about the Premises, or (e) commit or allow to be committed any, waste in, on, or about the Premises.